There is no doubt anymore. What the Tales has been saying in posts, long before the mainstream media has finally seemed to recognize at this late date, is that their has been a major cover-up going on regarding the terror attack in Benghazi, Libya where four Americans lost their lives on September 11, 2012. The only question may have been who participated in the cover-up. That also is obvious now to any reasonable thinking person. There are three main participants in the cover-up. Tales does not really need to name names because you, obviously being an intelligent thinking person as one who reads the Tales, know who they are. We will just bring out these facts for those undecided if there was a cover-up or not. Hillary Clinton's involvement has been established in this recent post from the Tales, "Now we know it never made a difference to Hillary." Hillary had to promote the idea of a U-Tube video causing a spontaneous crowd to get out of hand to cover up her and president Obama's lack of providing the security that those under her command had begged for. Also, the previous warnings of the CIA of the dangers from terrorists because of attacks at other embassy's had to be covered up by Secretary Clinton and President Obama or it would have showed their dereliction in duty to take measures to protect Americans under their command. The president of the United States was in re-election mode and couldn't have any little terrorist attack ruin his getting re-elected. The president ran on the foreign policy theme that he killed Bin Laden, Al Qaida had been decimated and was on the run, and Barack Obama had basically won the war on terror. So, to admit that this was a terrorist attack by an Al Qaida affiliated group would blow the president's main foreign policy meme to shreds and threaten his re-election. On September 20, 2012 President Obama and Hillary Clinton made their own video for Pakistan TV to apologize to the Pakistani's for the " hateful, anti-prophet Mohammad" video made by an American. They told Pakistan TV that the United States had nothing to do with the video. On September 20, 2012 president Obama appeared on the Spanish television network Univision telling those reporters that an investigation was under way to find out what really happened in Benghazi. On September 24,2012 president Obama appeared on "The View" and said they were still doing an investigation to know if a terrorist attack took place. On September 25, 2012 before the United Nations the president of the United States spent 5 minutes talking to the world about the "hateful" U Tube video. Now, eight months after the terrorist attack [May 13, 2012] the supposed most transparent president in history has called any further talk about the edited talking points of the Benghazi attack "a side show and all politics." The last refuge of a politician engaging in a cover-up is to say his accusers are playing politics. 1. President Obama a co-conspirator in deceiving the American people to cover-up the truth about the Benghazi Al Qaeda terrorist attack. 2. 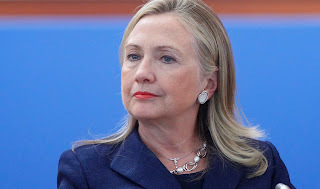 Former Sec of State Hillary Clinton a co-conspirator in deceiving the American people to cover-up the truth about the Benghazi Al Qaeda terrorist attack. 3. The main stream media, are co-conspirators in deceiving the American people to cover-up the truth about the Benghazi Al Qaeda terrorist attack. May the cover-up unravel-the truth come out-and justice be done. I think this is THE BEST EXPLANATION out there! Way to go Mr. "B". Tribbles hits the nail on the head! Thanks Krissy! You are too kind! Blessings.